Pressure washers of all kinds are designed to perform the same functions where water enters the machine at low pressure, and electric or gas motors will force it out applying high pressure to the surface it is attempting to clean. There are two power sources to choose from and depending on the cleaning power you need one will be more suitable than the other. 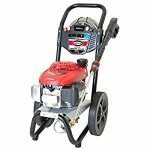 If you’re on the hunt for more pressure than a garden hose, we’re here to help you look at some of the best electric and gas-powered pressure washers followed by a helping pressure washer buyer’s guide — we offer the best pressure washer reviews around and worked our but off to make your life simpler.. 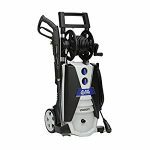 Here is the Sun Joe SPX3000 Pressure Joe 2030 PSI 1.76 GPM 14.5-Amp Electric Pressure Washer that is ready to handle various cleaning jobs such as driveways, decks, and much more. The pressure washer comes loaded with two convenient detergent tanks with its detergent selection dial that easy to switch between different kinds of detergent. We like the extension spray wand and rear wheels making this machine accessible to hard-to-reach areas and highly portable for maneuvering around on flights of stairs. Q – Will it do good on landscape rocks?A – Yes, and you have different nozzles to choose from to adjust the PSI. It works terrific! Q – Will it get the green mossy gunk off of my shingles? A – Yes! It will remove all of the gunk without damaging any of your shingles. Q – Do you ALWAYS have to use detergent? A – No. You can use it with just water. Q – Do all of the nozzles come with the unit or are they sold separately? 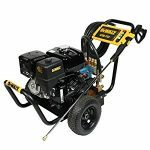 Here is the Sun Joe SPX3001 Pressure Joe 2030 PSI 1.76 GPM 14.5-Amp Electric Pressure Washer that is very similar to their favorite SPX3000 electric pressure washer mentioned above with an improved metal water inlet. The makers listened to the complaints that were made of the cheap water inlet and gave us the SPX3001. It’s ready to handle various cleaning jobs such as driveways, decks, and much more. The pressure washer comes loaded with two convenient detergent tanks with its soap selection dial that easy to switch between different kinds of detergent. We like the extension spray wand and rear wheels making this machine accessible to hard-to-reach areas and highly portable for maneuvering around on flights of stairs. This is the best electric power washer on the market today, in my opinion. Q – Can I use bleach in the tank? A – No. It is not recommended to use bleach because it will harm the internals, so a concentrated solution is best. 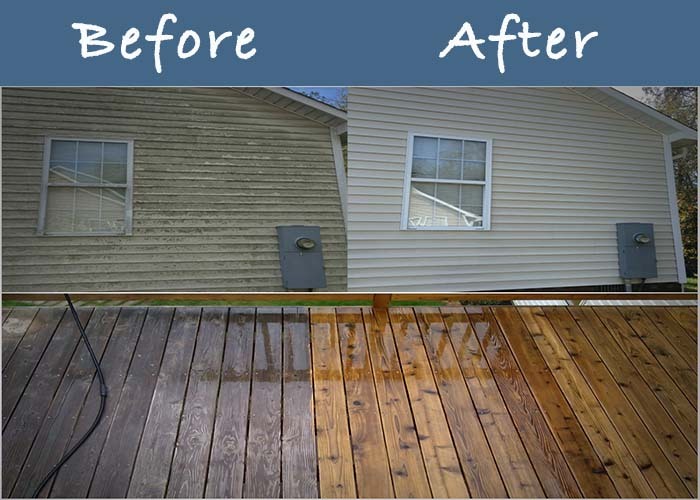 Q – Will it be powerful enough to pressure wash my wooden deck before I stain it? Q – Is the pressure adjustable? A – Not it’s not adjustable. Q – Can I use the pressure washer with a hot water hook up? A – No. Don’t hook the pressure washer to a hot water. Here is the AR Blue Clean AR390SS 2000 psi Electric Pressure Washer with Spray Gun which is an upgraded version of their 390 model. It produces 2000 psi being 30 times as stronger than any garden hose could ever be without using as much water consumption reducing it by 80% ideal for areas with a high percentage of drought. We like the attached 25-degree nozzle tip that delivers a pencil-point high-pressure spray. Q – Do the spray nozzles come with a metal or plastic connection? Q – Can this unit be used with hot water? A – Water temperature shouldn’t exceed 120 degrees Fahrenheit otherwise, it will melt the internal parts and seals. Hot water will destroy the pressure water and it works best with cold water. Q – Does this pressure washer apply soap with high-pressure or low-pressure? A – Low-pressure only, but if you do not use a nozzle, it will spray soap on high-pressure. Q – Is the pressure suppose to fluctuate when you first turn it on? A – Yes, for a few seconds it will fluctuate in pressure then it will run consistent pressure. 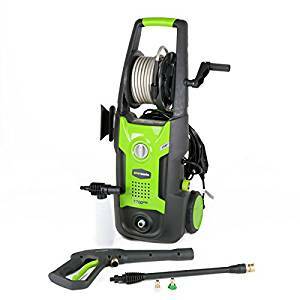 Here is the Ivation Electric Pressure Washer 2200 PSI 1.8 GPM with Power Hose Nozzle Gun and Turbo Wand, and all parts are included and has a Built-in Soap Dispenser optimizing your various cleaning tasks such as lawn equipment, deck, patios, vehicles and much more. Utilizing its 2200 Psi pressure users will wash and clean effortless while using its automatic shut off system. We like the 5-interchangeable quick-connect nozzles connected with a copper gun hose for added durability instead of plastic. This is probably the best cheap pressure washer for the home. Q – How long is the wand hose? Q – Can I use hot water with this unit? A – No, it will destroy the pressure washer. Q – Is the soap dispenser removable? A – The soap dispenser is not detachable. Q – Are the fittings made of plastic or metal? A – A plastic connection on the front and copper on the back of the inlet and it’s pretty durable. Here is the GreenWorks GPW1702 13 amp 1700 PSI 1.2 GPM Electric Pressure Washer with Hose Reel that makes “getting the job done” an effortless role for the operator. A reliable pressure washer without the high-maintenance and need for gas at high prices. Uses a power universal 13-amp motor that is water resistant which will extend the life of the unit. Generates 1.2 gallons per minute of consistent water flow and we like handy Quick-Connect nozzles designed to accommodate various angles such as 0-degree, 25-degree, and 40-degree plus this model has additional accessories sold separately that can optimize your cleaning experience. 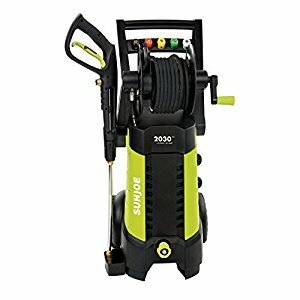 I think this is the best pressure washer for the home in my opinion. It’s neatly packed and versitle. Q – Is the hose made of vinyl or rubber? Vinyl kinks up and is frustrating. A – It’s made of rubber. Q – Is this unit strong enough to handle cement and dirty driveways? A – Yes, just be sure to use detergent for the stains. Q – Does it have a foam cannon? A – No it doesn’t. It has a detergent dispenser that works at low-pressure. Q – Will the pump turn off when I release the trigger? A – Yes, it will shut off automatically. 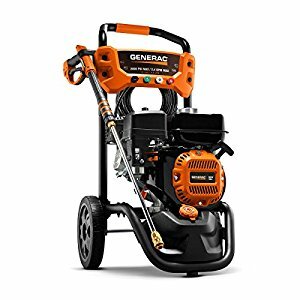 Here is the Generac 6922 2,800 PSI, 2.4 GPM, Gas Powered Pressure Washer is an affordable, reliable, and compact, powerful cleaning power unit designed to clean everything from decks, driveways, to patio furniture. We like the easy to assemble body that is user-friendly and highly portable even when rolling it on harsh terrain. It also has a cushion grip handle and an easy-to-pull spray trigger reducing fatigue while requiring minimal effort from the user. Q – What engine cycle? A – A 4 engine cycle. Q – Can this unit be used on vehicles? A – Yes, but do try and use the 40-degree angle to avoid harming the car’s paint. Q – Will I have to treat the pump in between use? A – No, as it is already sealed and lubricated. A – No, but changing the nozzles with change the pressure. 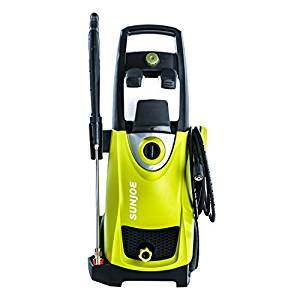 Here is the SIMPSON Cleaning MSH3125-S 3100 PSI at 2.5 GPM Gas Pressure Washer that is Powered by HONDA using maintenance-free OEM Technologies Axial Cam Pump that is ideal for the DIYer’s and anyone looking to enhance the look of their home with minimal investment. Clean your patio furniture, house siding, prepare your home exterior for paint jobs, etc. The unit powered by a premium Honda OHC engine that’s built with only high-quality components for maximum performance. We like the easy startup and that the pressure is consistent even in harsh environments. Q – Does it have a tank to use to fill with detergent? A – No tank for the detergent just a hose that can be placed into a soap container. Q – Does it work well on shingles, like white cedar? A – Yes it works terrific for shingles. Q – Can I use it on my car? A – Yes you can but use the correct nozzle tip as it is powerful. Q – Can I use bleach in this unit? A – Never use bleach as it will damage the washers internals and become corrosive. 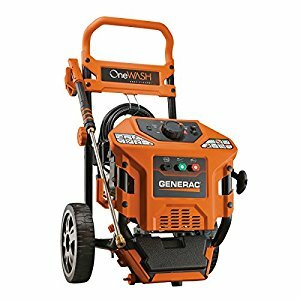 Here is the Generac 6602 OneWash 3,100 PSI, 2.8 GPM, 4-in-1 PowerDial, Gas Powered Pressure Washer that works with a variable speed allowing the operator to control the pressure output for various cleaning applications with the innovative Power Dial. Users will get total control over dirty jobs such as vinyl siding, decks, fences, patios, and even brick and concrete. We like that the intensity of the spray delivers various ranges of surfaces that can be tackled including automobile finishes. Q – Can it pull water out from a water tank? A – No. The pressure washer is designed to run when used with a running water supply from a hose that gives 3+ gallons of water per minute to the pump. The manual states to not run this unit from a standing water tank. I would expect the pump to burn up if you were to try this, as the pump is not capable of handling this type of application. Q – Does this unit come with a cleaning solution injection system? A – Yes, the tank is in the lower front and has a clear tube for you to push onto the brass barb that is pointing up in the back, then put the suction end into the tank. Once you put the soap solution in the suds will only flow when are using the black soap nozzle. Check out the Powerfit PF31005A Quick Connect 6-in-1 Changeover Spray Nozzle. The pressure washer has two soap settings, and it makes washing the cars so much easier. Q – Does it use a lot of water? A – That will depend on the application and the nozzle you use. Q – Can this be used to clean pool screens? A – Yes just don’t aim too close to the screen and adjust the pressure according to the application. 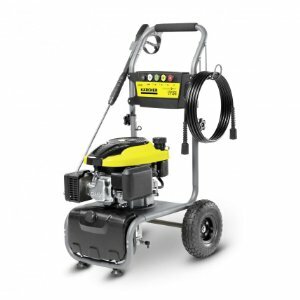 Here is the Karcher G 2700 Gas Power Pressure Washer that delivers outstanding, durable strength and designed with a welded steel frame made to last for longtime withstanding harsh tasks with frequent use. This beast produces up to 2700 Psi for just the right pressure and cleaning power for various household jobs. We like the convenient folding handle that is completely compact for easy storage. We also like the pro-style Quick-Connect nozzles that produce very effective spray patterns for all types of cleaning applications. Two different manuals with misguided instructions on how much oil to fill – only fill oil 3/4 up the dipstick to prevent smoke from coming out of the tank. Q – What is the Max Idle time? Q – How to lower the pressure? A – The black nozzle lowers the pressure for you. Q – Can you adjust the Psi? A – Yes, by changing the nozzles. Q – Will the unit connect to a water hose or do you have to fill the tank with water? A – Yes it connects to a hose and the tank is used for the cleaning detergent. Here is the Dewalt DXPW4240 4,200 PSI 4.0 GPM Gas Pressure Washer with Honda Engine that we were a bit apprehensive of adding onto this list due to the high cost and the minimum reviews leaving us with not too much to gauge our review. However, the high power is what we’re adding it to those that don’t mind the cost and want various price ranges to look through. The DXPW4240 is ideal for professional cleaning services such as graffiti removal, wood restoration, deck cleaning, paint preparations, etc. It is gas-powered with a commercial series engine by Honda GX OHV and designed to take on some of the most rigorous tasks thrown its way. Built to outperform other pressure washers finishing every job it starts. Q – What kind of oil is needed for this gas pressure washer? A – 10W30 in the engine and 15W40 in the pump. Q – What is the Horsepower? Q – Will this unit be too powerful for use on my cars? A – You can use it on your car by following these simple tips. Slow down the engine RPM, ease off the red pressure knob, and make sure to stand farther away from your work surface when pressure washing delicate applications. Q – Can I adjust the amount of detergent dispensed? A – No. The injector is a fixed nozzle at ten parts water and 1 part soap. When you buy a concentrate one-gallon soap at Home Depot also get a 5-gallon bucket and follow the instructions from the soap manufacturer for the proper mixture. Remember not to never allow the soap to dry on the surfaces that you’re cleaning but give the soap time to work. Now that you’ve got to see some of the best electric and gas powered pressure washers available it is time to understand what to look out for when shopping for your first or new pressure washer as one may be more suitable for certain tasks and job functions in regards to power or portability, etc. Gas pressure washers deliver exceptionally more power and will work better for larger, tougher applications such as cleaning patios, decks and depending on the model you own, second-story exteriors. They also provide the user with better mobility than electric, since they don’t require you to be close to a power outlet as it runs on gas. Gas pressure washers usually crank with a manual pull-start, but many models include a convenient electric starter. Electric pressure washers are ideal for the smaller, lighter projects, such as cleaning small walkways, patio furniture, messy spills in the driveway, and bugs off of vehicles. They’re much quieter than gas powered units and more lightweight for transporting than gas models. The electric motor starts with an easy flip of a switch and will run much cleaner than a gas engine would. 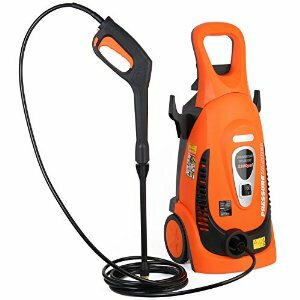 Many electric pressure washer companies will say that their units need to be plugged directly into an outlet using their built-in cord, with no extension cord acceptable, so keep that in mind whether you’ll have enough cord for the job otherwise a gas option may be best if the locations don’t have an outlet nearby. Understanding the pressure output in pounds per square inch (PSI) of the pressure washer is important in knowing the kind of duties it can efficiently handle. Lighter Jobs: For light applications, it is ideal for you to use a unit with 2000 PSI or less as that pressure works best on cars, siding, boats, and cleaning patio furniture, fences, and decks. Medium Jobs: For medium applications look to a washer with 2000 PSI up to 2800 as they can take care of tasks such as decks, siding, fences and patios effortlessly. Heavy-Duty Jobs: The heavier jobs will need 2900 to 3300 PSI to get the most out of the pressure washer. These types of tasks include large driveways, second-story cleaning, and preparing surfaces before starting a paint job. Extra-heavy-duty Jobs: Professional and commercial jobs will require a PSI of 3300+ and are ideal for paint preparations, etc. For applications needing a lot of power. These models will be a lot more expensive, too, so be sure your jobs need this much power. Optimize your jobs with some cool features that enhance any application you’re working on. Brushes: Brushes will let you add extra scrubbing power to your cleaning applications. Extension Wands & Spray Tips: Ideal for cleaning second-story exteriors. Angled Wands: These wands will help the operator reach gutters. Surface Cleaners: The surface cleaner that includes spinning jets make cleaning sidewalks and driveways super easy. Pressure washer chemicals: Solutions are available for various cleaning applications to help lift stains and leave the surface looking terrific but do make sure to follow the owner’s manual for chemicals approved for the unit. Many pressure washers include features that make jobs run much more smoothly. Take a look at some of the common features. Axial Cam/Triplex: Two different pumps designed to make the pressure washing operation run more smoothly and are maintenance-free. The axial is more for homeowners. Meanwhile, the triplex is ideal for commercial use as they deliver greater efficiency and have a longer lifespan. Various Nozzle Tips: You’ll want to look for a unit that provides interchangeable nozzles allowing you to adjust the pressure of the psi and flow for working on applications that need less or more pressure. Pencil-sized tips will deliver more pressure while wider tips produce less pressure and are built for applying cleaning detergent. Adjustable/Interchangeable Wands: Find units with adjustable wands if you want to change the spray pattern from low to high-pressure without the need for changing out the nozzle tip and interchangeable wands that are preset for specific cleaning applications, so there’s no need for changing the tips. Rotating Nozzles: Delivers a circular motion which increases the power of the spray. Onboard Detergent Tanks: Having an onboard tank for your soap is a lot easier than carrying around other containers making cleaning larger areas easy. Detergent Injector: Like the built-in detergent tank this allows for easier accessibility and is usually designed as an onboard tank or siphoning tube. Thermal Relief & Unloader Systems: These systems are built to minimize the heat and pressure buildup that could potentially destroy the pressure washer internals and externals.